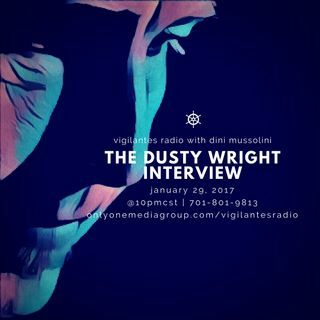 GiantFinger member, podcast & video-cast host, TV show writer & singer/songwriter, Dusty Wright, stops by and chats with Dini Mussolini about his musical journey, the things he's accomplished along the way and the things he hopes to conquer in the near-future. Set your reminders, it's happening! 01/29/2017 | @10PM Central Standard Time | Call in at 701-801-9813 | or hop in the mix via browser by visiting www.onlyonemediagroup.com/vigilantesradio and ... Maggiori informazioni slapping that "Go Live" button. Be sure to subscribe over at spreaker.com/onlyonemediagroup & sharing is caring! Esplicito The Dusty Wright Interview.